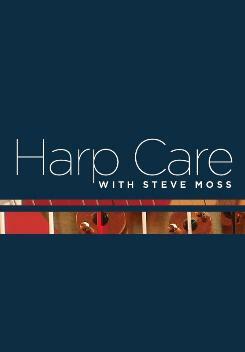 Harp Care with Steve Moss is a complete video course in basic harp care and maintenance. The DVD contains over 80 minutes of video, packed with step-by-step demonstrations and clear, concise information. In no time, you'll be able to clean, tune, restring, and move your harp like a pro. Moving Your Harp With a Dolly: the keys to safe and easy moving - even on stairs! Steve Moss spent eight years in the Lyon & Healy harp factory in Chicago, specializing in assembly and final regulation of both pedal and lever harps. Since forming Moss Harp Service in 2003, he has traveled the United States, performing harp maintenance and repair for major symphony orchestras, universities, and private clients from beginner to professional. He is certified by the Lyon & Healy, Salvi, and Camac harp companies. He is in demand as a clinician at conferences and harp camps, and has presented at the American Harp Society national conference. Or Click here to shop for more great products! "This is a very helpful video for harpists (new and old!) who have questions about the very important basic care of their instrument." I wanted to tell you what a nice job you did with the DVD! Not only is the content info excellent, the DVD is beautifully produced! Nice job!" "This is a long-overdue thank you for your wonderful Harp Care DVD. Filled with important information, which you delivered in a clear and reassuring manner, it has helped me over the abject terror of changing strings, and it's given me a much better understanding of how to take care of my harp. Thank you so much for sharing your expertise in this way!" "Your video is well done, a really good overview. Congratulations!"